Here is a collection of articles that will help you understand and better explore Yangshuo local culture. The now famous Liu Sanjie show in Yangshuo had its premier in 2004 and is supposed to be the biggest natural stage in the world. The Liu Sanjie show was created by Zhang Yimao, who has also created and choreographed the opening ceremony for the 2008 Beijing Olympics and directed such famous Chinese movies as Raise the Red Lantern. Liu Sanjie is located about 2 km from West Street (4km from Yangshuo Mountain Retreat)and the show is performed on the waters of Li River and its surroundings. Twelve karst formations are lit up, utilizing the wonders of nature to form the backdrop to the stage. The performance can look different each time as mist, rain and moonlight naturally alter the set of the stage. Over 600 locals who are mainly farmers, fisherman and youngsters perform and sing to often over a 10,000 strong audience. The Liu Sanjie show is performed every night of the week apart from during periods of heavy rains. The show starts Monday to Friday at 8 pm however in peak season and on weekends there are two performances starting at 7.30 pm and 9 pm. Tickets can be purchased at the Yangshuo Mountain Retreat reception or in travel agencies in Yangshuo town. The ticket price does not include transport, however we can arrange a taxi for drop off and pick up or you can catch an electric minibus from Yangshuo town center. Liu Sanjie is a love story about a woman called Liu Sanjie, which means "third sister". Her voice was so beautiful that it touched everyone. Born in Liuzhuo and working as a farmer's daughter with her sister. The legend is that a warlord falls in love with Liu Sanjie but she has already fallen in love with a man from the village. The warlord does not accept this and kidnaps her but Liu Sanjie's lover and friends in the village go to free her and the couple escape living happily ever after. For more great Liu Sanjie photos go here . While a guest at our Yangshuo hotel, make a note to see the Liu Sanjie show. It's one of the best China cultural shows and the performance is very close to the Yangshuo Mountain Retreat. From our Yangshuo hotel, it's only a 10 minute taxi ride to Liu Sanjie show on the Li River. Our riverside retreat can help you with purchasing Liu Sanjie tickets and arrange taxi transportation from the Yangshuo Mountain Retreat. We also have complete Yangshuo informationabout other cultural performances and activities during your stay in Yangshuo China. Liu Sanjie tickets can sometimes be difficult to get at the last minute, especially during peak tourist season in Yangshuo. The safest way is for us to book the Liu Sanjie tickets for you at no commission. On your room reservation form, you can indicate what day you want to see the Liu Sanjie show and we will book the tickets for you in advance. Learn to cook Chinese food in a traditional Chinese farmhouse in the Yangshuo. The Yangshuo cooking school offers its customers the opportunity to learn how to cook real Chinese food in a traditional setting with skilled and friendly teachers who can impart the secrets of Chinese cuisine in a friendly and fun atmosphere. They emphasize a teaching style based on actually doing rather than watching. They will also take you shopping in the local market to learn about the ingredients that the Chinese use in their dishes. After cooking five dishes you will eat lunch together. Yangshuo cooking school offers a great way to learn more about local Chinese cuisine and enjoy a new cultural experience. From Yangshuo Mountain Retreat, the cooking school is only about 3km down a country road. Spend a day at the Yangshuo cooking school and learn to cook a variety of Yangshuo classic dishes. Please ask at Yangshuo Mountain Retreat reception to learn more and Yangshuo cooking school. Please note that since the opening of the Yangshuo cooking school, there are now many copycat schools, but we believe the original Yangshuo cooking classes are the best value. There's more information at our riverside retreat reception. We are not afiliated with the Yangshuo cooking school, but our guest reviews have been very positive, so we continue to recommend the school as a great part of a Yangshuo tour. Whether or not you are a guest at our Yangshuo hotel, we'll be pleased to help arrange Yangshuo cooking classes for you at this reputable school. The list of villages below offers an excellent glimpse into the rural side of China offering an authentic experience and a chance to soak up the local culture. Don't forget to check out the market days also listed below. Lying on the east bank of the Li River upstream from Yangshuo, ancient Xingping fishing village was founded during the Ming Dynasty in 1506. 48 traditional houses have been very well preserved and the special features of the houses make the Fishing Village a very interesting place to visit. Surrounded by karst formations the Yucun is only accessible by walking a narrow path or by boat. Bill Clinton made this place very popular as he paid it a visit in 1998 during his China trip. He expressed his admiration of the simple and authentic features of the village. The Yucun got its name from what the farmers do to earn a living: they fish. Their fishing techniques are very special as they use bamboo rafts instead of wooden boats and they use cormorants to catch the fish. Jiuxian is located very near to the Dragon River but is still a very quiet and not greatly visited village as it is not on the main Yangshuo to Moon Hill bike route. It is located on the Yangshuo to the Yulong (Dragon River) bridge route and makes a nice break along the way. Walk around this tranquil village and feel the peacefulness of this rural area. This village is near the Snow-Lion Hill in Fuli town. The official Chinese name is Mushan Village although in the local dialect it is called Bagua. Fuli Town has a history of over 1000 years and has become a popular place to buy handmade fans which are produced and painted there. As everywhere in Yangshuo county Fuli and Mushan are surrounded by spectacular karst hills and the waters of the Li River. This town is actually made up of 3 villages: Yima, Chao Yang and Chao Long. They are on the newly paved road between the Yangshuo Mountain Retreat and the Yu Long Bridge. The houses are made from mud bricks and villagers live their lives as they have done for hundreds of years. Although only a short distance from Yangshuo it often seems as time stands still in these small rural villages. This area can be seen easily on a bike ride or walk starting from our hotel incorporated with a course at the local cooking school (link to blog page with local vendors) or a bamboo raft ride on the river. The Stone Village is located North of Yangshuo about a 20 minute drive up the mountains. Its main feature is that all of the houses in this remote village are not made from traditional mud or ash brick but from locally quarried stone. Many of the houses are still in good condition, while there are also abandoned properties in various state of disrepair. There are only a couple of dozen families still left here, so it's an interesting look at how villages adapt and maintain their traditional life. Yangdi is an old small village between Guilin and Yangshuo on the shores of the Li River. It takes about 1hr 15 min to get there by bus. Yangdi is interesting on its own but is also the starting point of a beautiful hike to Xingping. Xingping is a small town which you can explore in about 1 hour. It has a long history and many buildings date back to the Qing and Ming dynasties. On market days the town comes to life and can get quiet busy with locals from the surrounding villages coming to buy and sell produce. The scenery around Xingping is magnificent and you can take a walk out of town on a nice path which crosses a tributary of the Li River and takes you onto a smaller road that runs along the river. After about a 45 min walk you will reach the spot where you can see the picture which is printed on a 20 RMB note. If you continue on this path you will get to the tiny village Langshi. There are boats nearby to bring you to Yangdi or Xing Ping from where you can take a bus back to Yangshuo. Pomeloes: First introduced to this area around three hundred years ago at the end of the Ming Dynasty, this highly visible fruit is slightly larger than a western grapefruit. In addition it peels very easily and is much sweeter than you might expect. While they become ripe in October, try to choose an old tree for the very best tasting examples. Oranges: A local variety, favored in and around Baisha town, look for glowing colors and shiny rinds, especially when they come into season in November. Horse Chestnuts: Anybody visiting Jin Bao Town during October is in for a very special surprise. Try them fresh, roasted in charcoal or perhaps stuffed into a succulent duck's breast. Persimmon: Westerners might find this fruit sickly sweet if eaten fresh. Alternatively wait until winter when your can try the pressed, sun-dried version which is much tastier. Also popular in traditional Chinese medicine as a natural cure for indigestion. Fans: Hand-painted, decorative fans are one of the most popular souvenirs to take home, especially for those visiting Fan Street in Fuli, where many local artisans specialize in this ancient art. Chinese Landscape Painting: Yangshuo has always been a magnet for painters and a very definitive style has evolved over the years. Who could head home without at least a couple of delicately brushed scrolls in their case to liven up the office wall? This particular stretch of river is known as the Golden Waterways. Take a local bus from Yangshuo to Xingping or we can help you to arrange a taxi from hotel to Xingping and walk to the docks of the town.The trip takes over an hour one way and arguably is the best stretch of the Li River in terms of scenery with huge karst peaks soaring from the shores of the Li River, sub tropical jungle shading the banks and long stretched pebble beaches. Take a local bus from Yangshuo to Xingping (50 min) and walk to the docks of the town. Here you can find many bamboo rafts which can take you upstream either to Lengshui or even further to Yangdi. If you want to walk back to Xingping make sure you have enough hours before it gets dark or arrange pick up in Lengshui or Yangdi. This Tour combines both walking and a bamboo rafting trip on the Li River. Catch a local bus to Yangdi which takes about 1 hr 15min. From there you can walk for approximately 3.5 hours along the shores of the Li River to Lengshui which is about 3/4 of the way between Yangdi and Xingping. In Lengshui take a 40 min bamboo raft trip downstream. Don't be surprised if they drop you off outside of Xingping as the bamboo taxis try to avoid paying the tax they have to give for floating into the docks. This is no problem as many electric minibuses run from the drop off point taking you directly to the bus station in Xingping where local buses leave regularly for Yangshuo town. At 9:30 a taxi will bring you to Fuli (about half an hour drive) where the local guide will pick you up and show you around the old part of Fuli town. Fuli is famous for the Chinese fans the people make there. From small to very big ones. After the trip through Fuli the guide will bring you his place to paint your own fan (about 4 hours, lunch included). Around 15:00 a taxi will bring you back to Mountain Retreat. 2 Pax and above: RMB 280 p.p. Fees for transportation, local tour guide (English speaking) and fan painting class. Mountain Retreat--->Yangshuo--->Bamboo boat dock--->Boat trip on Li river--->Fuli--->Mountain Retreat. 2 Pax and above: RMB 250 p.p. Fees for transportation and bamboo boat trip. Mountain Retreat --->Moon Hill---> Lunch in Luna--->Gold Water Cave --->Mountain Retreat. restaurant Luna (choice of different pizza/pasta and 1 drink included). After lunch a van will bring you to the nearby Real Water Cave for some fun mud experience and hot springs. The tour through the Gold Water Cave is guided and takes about 2 hours. A taxi will bring you back to Mountain Retreat. 2 Pax and above: RMB 210 p.p. Fees for Moon Hill, Gold Water Cave, transportation to the cave and back to Mountain Retreat and lunch in Luna (pizza or pasta with one drink included). A guide for the walk to and up Moon Hill is optional. Mountain Retreat ---> Local Family--->Mountain Retreat. You will take a combination of taxi and public transport to get to a local Family on the countryside and depending on the season you can see/help with the planting/harvesting of rice or picking of fruits. An English speaking local guide will go with you and tell/show you about the life on the countryside around Yangshuo where people grow rice, oranges, pomelo's, sugar cane, vegetables and often use water buffalo's on the land. You will have a simple lunch with the family. Tour times are flexible, please check with reception. 2 Pax and above: RMB 200 p.p. Transport to and from the local family (mix of taxi and public transport), lunch, local English speaking guide. Yangshuo is an ancient city with a 2000 year history. It is a small town in the Guilin region of Guangxi Province and was established as a county during the Jin Dynasty about 1500 years ago. Surrounded by amazing karst formations and bordered on one side by the Li River it is easily accessible by bus or boat from nearby Guilin. Over the years Yangshuo has developed into a bustling tourist destination with a relaxed friendly atmosphere similar to the towns found in South East Asia. However, the beauty about Yangshuo is that within a few minutes you can find yourself in a rural village watching water buffalo take a midday bath and farmers drying their produce on the ground without a single tourist in sight. At the hotel we can organize a tour guide to take you round and see the sights of Yangshuo or you can explore by yourself. The following paragraphs discuss some of the great sights to see whilst in Yangshuo. The Li River originates in the Mao'er Mountains in north Guangxi and flows through Yangshuo down into the Xi Jiang, the western tributary of the Pearl River in Wuzhou. It is one of China's most famous scenic areas and is famously thought of throughout China as being the most beautiful place in the world. A stretch of the river actually appears on the back of the 20 RMB notes. The river runs straight through Yangshuo offering ideal places to picnic and swim in the warm shallow water. It is also well stocked with carp which is the famous fish used in the popular Yangshuo beer fish dish. The gradual retreat of inland seas left thousands of exotic caves and bizarre limestone structures known as karst formations. There are over 70,000 peaks in total covering an area that stretches up to Guizhou and down to Nanning. Yangshuo is surrounded by peaks which make great viewing platforms of the town and Li River. Green Lotus Peak is one of the more famous karst formations and is located on the banks of the Li River. It get its name simply because it is said that it looks like a giant lotus rising out of the river. It takes approximately 30 minutes to climb and the views are spectacular. For a spot of shopping West Street (Chinese: Xijie) is the place to head. Walk along the cobbled street and you'll find many things to buy. You can watch silk being woven or silver being hammered into shape. Just remember to bargain hard and you'll have a great time! Yangshuo has a huge number of restaurants and cafes to eat in all over the town. Among them are Japanese, Thai, Western, French and of course countless traditional Chinese restaurants ranging from hotpot, to dumpling houses to choose from. If it's a local fresh Chinese dish or a taste of something familiar you are after then Yangshuo will not disappoint. Over the years the nightlife in Yangshuo has also blossomed into a thriving scene. KTV clubs, western style bars and laid back cafes fill the night air with a lively, relaxed atmosphere. Taxis are available around the clock so it's easy to get back to the Retreat whenever you feel like calling it a night! An inexpensive way to get from Yangshuo Mountain Retreat to the center of Yangshuo town, is to take a public minibus, which is a 20 minute walk from the Yangshuo Mountain Retreat. The minibuses come by every 5 10 minutes and take you into Yangshuo in under 20 minutes for only 2.5 RMB. It's a great bargain if you don't mind sharing with local people and their bundles. If you prefer to take a taxi from the Yangshuo Mountain Retreat, we can have a car waiting for you in 15 minutes. Local drivers charge RMB 30 to go to Yangshuo, but it's faster and certainly a better option in bad weather. If prices change, we will update the Yangshuo information in our online guide. The food markets in Yangshuo are a less well known feature of the town but are great to see nevertheless. The daytime market is near the bus station on the road out to Guilin selling everything from mountains of fresh vegetables to buckets of frogs and tasty morsels of dog meat. This is perhaps not a place for the squeamish but a great way to see an authentic market in Yangshuo. The location of the nighttime market seems to change every now and then so please ask at the hotel to check location. The market is a great mix of sounds and smells where you can walk among the stalls watch the food being cooked and pick what you want to eat from the many varieties they have on offer including fresh local vegetables and snake meat. In China Tai Qi is practiced to keep fit and healthy and enhance Kung Fu fighting skills. You will see Tai Qi being practiced mostly as an early morning form of exercise. The most common form of Tai Qi is with movements of the body but it can also be done with weapons including fans and swords. The movements of Tai Qi are slow versions of defensive or aggressive positions and although it may appear not to be very strenuous it can in fact be very tiring using up a lot of energy. It is an excellent exercise for coordinating all of your body muscles by moving them at the same time. With Tai Qi, you learn to control your breathing, pulse and muscles coordination. At Mountain Retreat you can book Tai Qi lessons, the instructor will come to hotel and you can learn the mastered techniques on the banks of the river. This is often the perfect way to start a day and get your body relaxed and refreshed for exploring Yangshuo County! You can find of the best T'ai Chi (tai qi) masters right here in Yangshuo China. If you've ever thought about learning T'ai Chi, why not learn in Yangshuo from some of the best teachers in China. We can arrange for your instructor to come to the Yangshuo Mountain Retreat and you can practice on our expansive lawn on the banks of the Yulong River. Our Yangshuo hotel is a perfect place to enjoy a t'ai chi lesson and a delicious riverside meal. For a truly remarkable local cultural experience, we recommend the Li River cormorant fishing demonstration. A local fisherman with birds on his raft will have them dive for fish and bring them back to the raft. The fisherman will take the fish and reward the birds with some small baitfish. With the deomnstration by lantern light and the fisherman in traditional clothing, it makes for some of the best photo opportunities and children will love the experience. Yangshuo Mountain Retreat reception can arrange round-trip transportation to the cormorant fishing show on the section of the Li River by Yangshuo town. 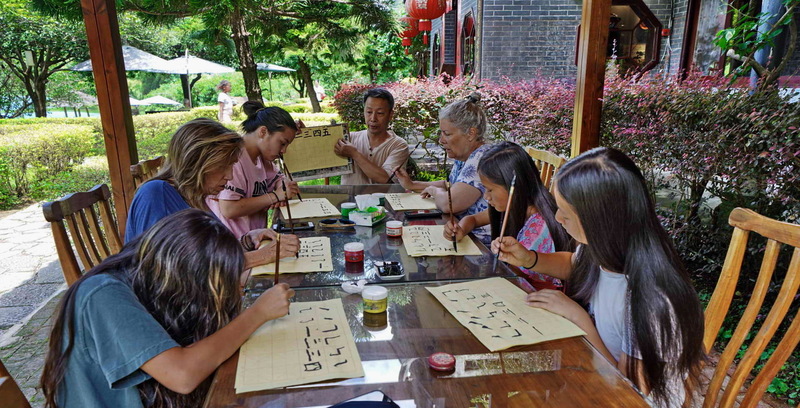 At the Yangshuo Mountain Retreat we offer Chinese language lessons and calligraphy courses that you can do at your own time and pace. Our teachers are qualified and will tutor you in our meeting room or in the outside garden area on the beautiful banks of the Yu Long River. You can decide which aspect you want to learn whether it be speaking Mandarin, writing and reading the characters or both. You will have one lesson per day for 60 min. The teaching hours are flexible and can be arranged to suit your needs. I graduated from the English Department of Yulin Teachers' College in 1994. Later, I continued to educate myself. Today I have all the required teacher examinations and graduated at Guangxi University. I worked as an English teacher in Beiliu Teachers' School for eleven years before I came to Yangshuo.